Hawaii Native Status: Cultivated. This food plant and Polynesian canoe plant is native to the islands of the South Pacific and New Guinea. Description: The tiny, drooping, awnless flower spikelets are in feathery, silvery purple, up to 2 foot (0.6 m) long panicles at the mature stem tips. 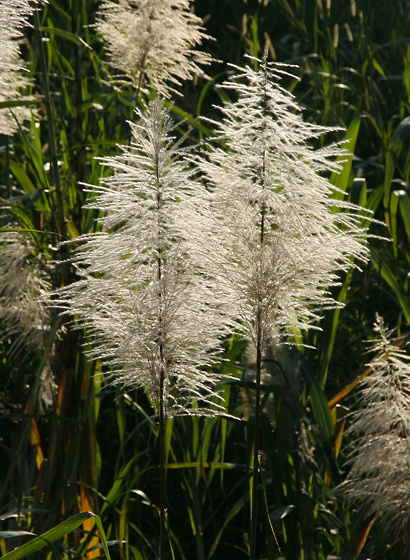 As they age, the panicles turn whitish. The leaf blades have rough, rasping, saw-toothed edges that can cut skin, a thick midrib, and are green and linear in shape. The stems are woody, bamboo-like, leaning, 1 to 2 inches (2.5 to 5 cm) thick, ringed by conspicuous internodes, and green, brown, red, or purple in color depending on the cultivated variety. This large grass is clumping and thicket-forming. 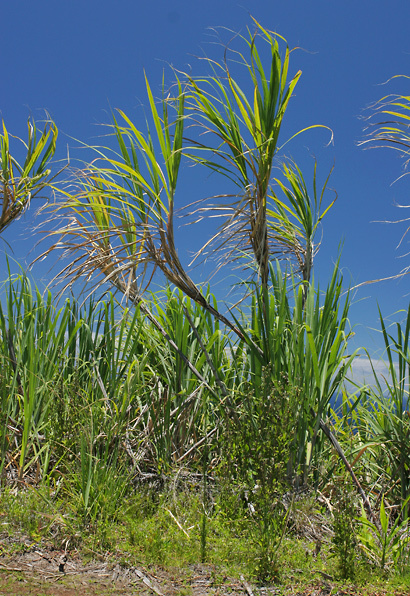 Here in Hawaii, Sugarcane is found growing in fields or along field edges at lower elevations. The plants are grown to produce sugar and fiber, and they are propagated by stem cuttings. 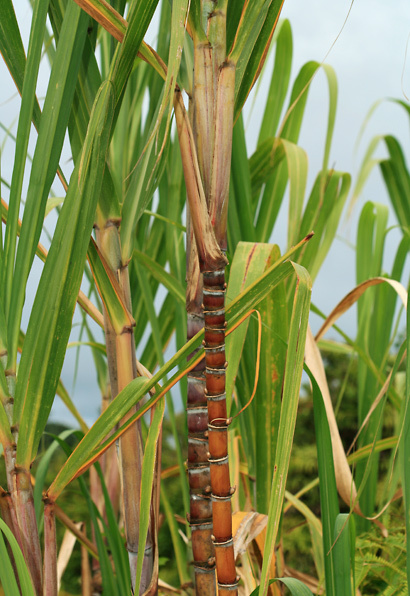 Canoe Plant – Sugarcane was originally brought here to Hawaii by the ancient Polynesians in their canoes. Hawaiians used Sugarcane for food, juice, and to sweeten other foods. They also used the plants for a variety of medicinal purposes. 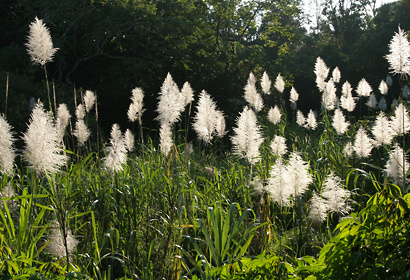 The flower stalks were made into game darts, and the leaves were sometimes used for thatching. Sugarcane charcoal was used as a dye. Edible – The sugary sap (cane juice) from inside the stems is commercially processed into cane syrup, cane sugar (sucrose or table sugar), and molasses. It is also fermented to make rum. The sweet, whitish, fibrous raw pith inside the stems can be chewed as a refreshing snack.